By: Ryan - Editor at Hamilton Billiards | Posted on: January 30, 2017. 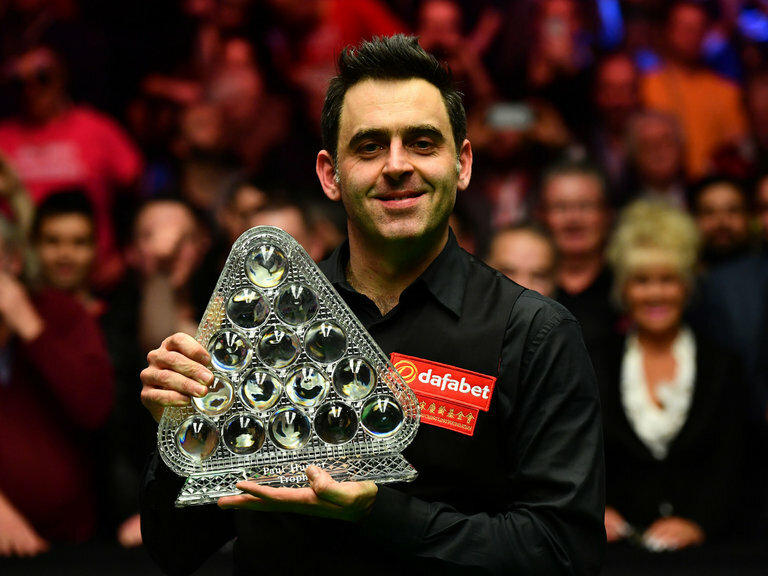 History was made at Alexandra Palace on Sunday, as Ronnie O’Sullivan came from behind to beat Joe Perry and claim a record seventh Masters title. The Rocket hadn’t been at his best in the tournament, but he held his nerve to claim the win, moving ahead of Stephen Hendry’s six. O’Sullivan, the reigning champion, hadn’t enjoyed the best fortune earlier in the tournament, having suffered from a virus during the first round. He came within a whisker of losing that match, when Liang Wenbo missed the black that would have given him victory, and he’d been generally below par, though with enough flashes of brilliance to see him through. Perry, playing his first Triple Crown final, took an early 4-1 lead, but missing an easy red let the champion back in. O’Sullivan capitalised by winning seven frames in a row. Perry narrowed the lead, but O’Sullivan stayed ahead and finally won 10-7, courtesy of a break of 112 and a nail-biting tactical frame, to claim the trophy that’s now renamed in honour of the late Paul Hunter. Born Ronald Antonio O’Sullivan in 1975, Ronnie was an early prodigy. He scored his first century break at the age of ten, turned professional at sixteen and won his first major, the 1993 UK Championship, the following year. His first Masters title followed two years later, and he remains not only the youngest player to win the Masters, but also the youngest to win any major title. O’Sullivan has been fascinating the public ever since. A brilliant but sometimes controversial figure, he’s noted not only for the thrilling style of play that gave him his nickname, but also for a difficult personal life, dogged by depression and drug abuse. Nevertheless, when he’s at the snooker table all the problems fall away, and audiences love to watch him amassing record numbers of both breaks and titles. Ronnie O’Sullivan is undoubtedly one of the greatest players in the history of snooker, and he’s far from finished. With just two more Triple Crown titles and nine more ranking titles to pass Stephen Hendry’s current records, the Rocket will doubtless be thrilling audiences with his rapid-fire break-building for many years to come.